The Life Cycle Initiative is in full speed with the preparations for the UNEA4, which will take place in Nairobi from 11-15 March (with related events already from 4 March). The Initiative and its UN Environment Secretariat are leading and supporting events, providing inputs to the Ministerial Declaration, as well as supporting the various Resolutions that member states have put forward. • During the Science, Policy and Business Forum (8-10 March), present the Sustainable Consumption and Production Hotspots Analysis Tool (SCP-HAT), and explore the potential opportunities brought by frontier technologies to exploit Big Data for LCA dataset generation. • Organising panels and talks during the Sustainable Innovation Expo, including the Panels on “Working Together to Beat Plastics Pollution”, Sustainable Textile Value Chain, and sustainable procurement in the tourism sector. Please keep a close eye on the updates of our social media in March during UNEA4, as well as the event’s website http://web.unep.org/environmentassembly/. 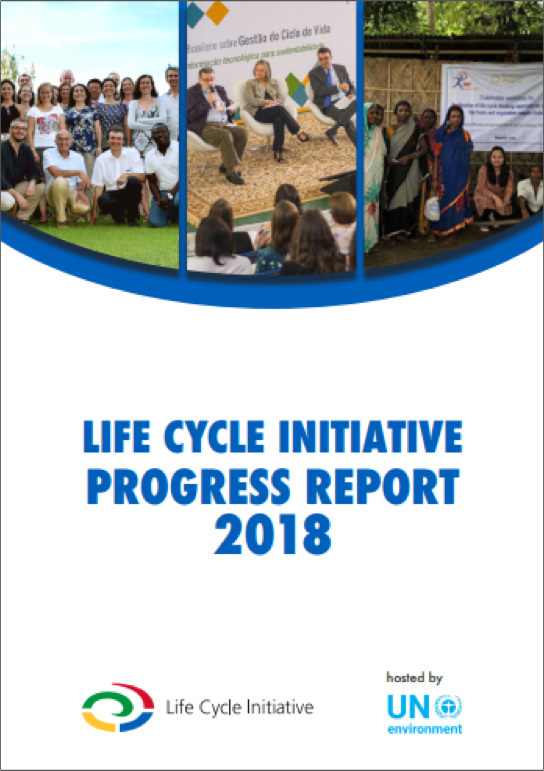 Life Cycle Initiative’s 2018 Annual Activity Report is online! 2018 was an exciting year packed with many deliveries. Highlights include growth in our engaged and active membership base, the addition of two new funding partners, the election of three new Steering Committee members and good progress on our three main programme areas: Technical and policy advice, Capacity development, and Knowledge. Get details on all the progress and achievements made in the 2018 Progress Report. The European Commission, in cooperation with UN Environment and the Life Cycle Initiative, is organizing the first social LCA metrics workshop open to all stakeholders, members states, and LCA practitioners on the 5th of April 2019. The aim of the workshop is to monitor the status of Social LCA and have an open debate on future steps. Please note that the participation is free of charge, however there is no possibility to offer travel support to participants. There is a limited number of places and the workshop will take place in DG GROW premises (Avenue d'Auderghem 45, 1040 Bruxelles) therefore registration is absolutely required for security reasons. More details will be available in DG GROW website. For more information and registrations please contact Manfred Fuchs or Claudia Topalli. In the Initiative’s project ‘Linking the UN Sustainable Development Goals to life cycle impact pathway frameworks’, LCA 2.-0 Consultants and PRé Sustainability aim to create a methodology to link the SDGs to life cycle assessment. Using this methodology, companies can measure and report their impact on the SDGs. 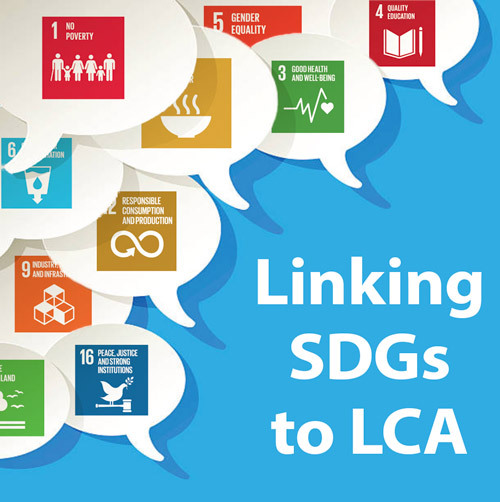 The project team have now developed two approaches to link SDGs and LCA. In order to make use of relevant scientific and business knowledge, we are organizing a stakeholder consultation process that runs in parallel with the technical development throughout the project. The aim is to continuously inspire and challenge the development of our approaches and to reflect on the experiences of using the project outcomes. We would be happy to receive your input on 4 key topics we address in the first stage of our project. The case studies show applications in diverse sectors with examples from 10 different countries. Such diversity shows that the application of Life Cycle Thinking is moving towards the mainstream. It is a great indication that the Life Cycle Initiative is advancing on its goal to enhance the feasibility of life cycle approaches on a global scale. The report will be available for download on the Initiative website in mid-March. On 26 May, the European Commission, in collaboration with UN Environment and the Life Cycle Initiative, is organizing a free training for LCA practitioners of the PEF/OEF rules in Helsinki, back-to-back with the SETAC Conference. Please note there is no possibility to offer travel support to participants, but a share of the 50 places will be provided in priority to participants from developing countries and emerging economies. Save the date in your agenda! Get more details and how to register. The Life Cycle Initiative is thrilled to announce a competition to win participation in the 9th International Conference on Life Cycle Management, to take place on 1-4 September 2019 in Poznan, Poland. Participating is easy! All you have to do is to complete the e-learning module on Life Cycle Thinking and tell us how you are using Life Cycle Thinking in your personal or work life. One winner will be selected among all submissions. The winner will receive travel support (according to UN rules and regulations) as well as access to the conference. 1. You must have completed at least two blocks of the e-learning module (in whichever language you like). 2. You must submit a short description (maximum of 1000 words) of how you are applying the concept of Life Cycle Thinking in your personal or work life and what kind of impact it has had. Submissions must be made in English. Members of the conference organising committee cannot apply to this competition. This competition is held under the REAL project with the financial support from the European Commission. Please send your submission to Ms Kristina Bowers by 12 July 2019. Quantis and EA launched the Plastic Leak Project (PLP) in Feb. 2019, to develop robust metrics to help shape operational solutions and effective actions to address the plastic and microplastic pollution crisis. The project will develop a methodological guide for companies to locate, map and assess plastic leakage along their value chain. UN Environment and the Life Cycle Initiative sit in the strategic committee of the PLP project, to provide technical guidance on the development of the methodology. The PLP project also collaborates closely with the Initiative’s project “National Guidance For Marine Plastic Hotspotting and Shaping Action”, to ensure consistency of the methodologies developed for countries and business. This year’s World Resources Forum (WRF 2019) will take place in Geneva, October 22-24, 2019. The overall topic of the conference is “Anchoring Sustainable and Efficient Resource Management” with emphasis on following topics: I. Policies and Governance; II. Technology, Industry and Environment; III. Sustainable Lifestyles, Communication and Education. Life cycle thinking is a cross-cutting topic in the program. Scientific Sessions are a key element of the WRF 2019 overall program and the Call for Papers is now open. We invite you to submit scientific abstracts by April 19. Participants from least developing countries with outstanding contributions looking for partial funding are encouraged to submit the abstracts by 20 March. For more information, please contact the WRF Secretariat. We call all life cycle minded young champions out there to apply for the Young Champions of the Earth 2019 awards! Please share your ideas by applying by 31 March 2019, and we hope to have one young champion from the life cycle community to share your creative solutions to the world’s most pressing environmental challenges. An LCA Awards scheme was launched in 2017 by the Life cycle Initiative to support selected practical projects in implementing Life Cycle approaches. This activity leveraged support from LCA experts and providers of LCA software and data. 62 applications were received, out of which 44 were accepted and granted with LCA tools for implementing proposed projects from July 2017 to July 2018. Of the 14 final reports received, assessment varied across sectors including textiles, building materials, waste and agri-food products (coffee beans, cassava, etc. ), covering social and/or environmental impact as well as mapping the hotspots. Based on the results of LCA tools applied, studies propose strategies and recommendations to mitigate impacts. We would like to take the opportunity to thanks the great contribution from FICCI (Federation of Indian Chambers of Commerce and Industry) and WRF (World Resources Forum) for organising and monitoring the awards. We are also grateful for all the devoted sponsors who kindly provided free LCA software and data to awards winners: Gabi (thinkstep), SimaPro (PRé Consultants), Umberto (ifu Hamburg - member of iPoint Group), Ecoinvent, WebLCA+CLCD (IKE), PSILCA (GreenDelta), and SHDB (New Eearth B). The American Center for Life Cycle Assessment (ACLCA) is hosting its 3rd LCA conference in Tucson, Arizona. It is a great opportunity to connect with experts from academia, industry, consulting and, government and NGOs on the latest innovations in life cycle thinking. The Congress is organized by the Mexican Association of Engineering, Science and Environmental Management (AMICA) and Greening of Industry Network (GIN). The deadline of abstract submission is 15 March 2019. Thank you to the Life Cycle Initiative Funding Partners!